Today when you’ve arrived on Credo, you may feel like something is different but not be quite sure what. Over the last few months, I’ve been working on a number of visual and user experience changes on the logged out part of the site. My wife is a fantastic designer, mostly focused on UX though she is also quite adept at the visual arts. Because she is awesome, he has helped me out with rethinking some parts of the site that needed the love. I rolled out some of those changes this weekend, so here’s what’s new and what we’re moving towards over time. Expanded pros that are emailed about leads so that if a lead says they are looking in the $1-2k/mo range, the pros who have a minimum of $2000/mo will also be emailed instead of just pros who work between $1000-2000/month. This expands the number of pros who are notified of the lead by approximately 25%. Streamline the design across the site, creating a new style standard and guide for the rest of the site to (over time) follow. It already has been in place on /team/ and category pages (eg /pros/seo-consultants/) and this is the next step. On the /inquire/ page, to improve conversions through building more trust with the user that this is a well-designed and trustworthy place to find only the best digital marketers to help them grow their business. With the redone /confirmation/ and /confirmation-page/ pages, to set their expectations for what will come next. With the redesigned header, to streamline the design of the site font-wise and move toward a more sophisticated look. The top navigation still had the default style from the theme upon which this site is built (Vertex from Elegant Themes). 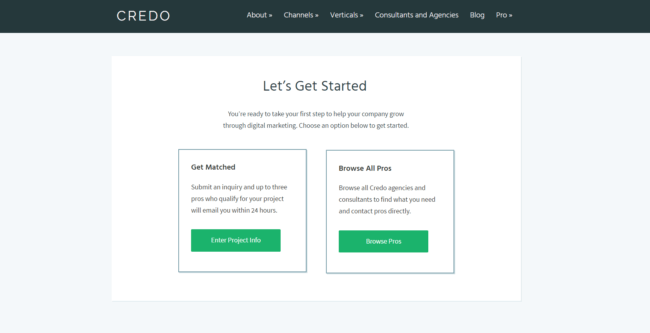 At the end of the day, what matters for Credo is converting visitors into leads that pros can then contact and close into clients. I also must balance the need to drive the general open leads (that Agency level members have access to) as well as leads specifically to pros as that benefits the Freelancer level members. It’s a constant balancing act that I am still trying to get right, and the advent of the /start/ page is another test in that direction. Some leads want to be contacted by the “right” pros, while others are still doing their research and want to use the site to research potential pros (and eventually contact them). Leads grew well over the month of August over July and continue to grow in September. By providing the /start/ page, they can choose their own adventure and be taken into one of two different flows – the /inquire/ page or a set of pages that narrows down their results to the pros who can do what they need for their budget. Of course, I would not roll out a page like this without keeping an eye on what it does to conversions, so I will be watching that over the next week or two and will then make a call on if it’s been effective or not, then change as needed. For everything I test, I make sure to have one goal in mind and one metric to improve whether that is leads, conversions to email list, time on site, or whatever other metric I think I need to improve in order to further the ultimate goal of more leads sent to pros. Test everything and measure it. When you’re early stage, get good directional feedback, ship it, and move on to test something else. Time is of the essence. You can always come back and test again later. Three of 5 made it to that step, even though I specifically asked them to, and 2 of the 3 said that they didn’t trust the design of the site. If you’re trying to make your site convert better, then I definitely recommend using a service like UserTesting, which I have no affiliation with but find very valuable. Location pages. Something agencies have been asking for and searchers in Google use to find a marketing pro. Case studies on pro pages. Redesigned pro page to better integrate reviews, location, budget range, and case studies. Redesigned form on profile pages. Expanding the number of pros that can contact a lead to 4, from the current limit of 3. Many of these are front end changes meant to continue the streamlining of design and building trust with potential leads as they visit the site through search, referral, or elsewhere. And of course, being a marketer, I am constantly working on creating great new content on the site. The real estate marketing guide is an example of what is to come as I work on a guide to SaaS marketing and a guide to marketing digital marketplaces. I am also guest posting a lot, with recent posts on Inman and many other real estate sites (to market the real estate guide) and some exciting upcoming posts on various sites online. 2016 has been a great year for Credo so far. I am super proud of what has been done so far and am super jazzed for the rest of the year and into 2017 as Credo continues to become the place for businesses to come when they want to find only the highest quality vetted digital marketers and agencies. Well that’s it for this time. Until the next update! Great post. Especially appreciate that you shared what you’ve learned so far. Quick question: What tool(s) do you use or recommend for CRO testing? Hey Eric! I am a long time and quite happy Optimizely user. There are plenty of other great A/B testing tools out there, but Optimizely suits my needs especially with their new-ish model of setting a monthly budget and only testing up to that.